Exports to China were 304,000 tons of the 505,000 tons the US shipped to Asia-Pacific. China imposed a 25% duty on imports of HDPE from the US on August 23rd. US exports to China peaked in June at 56,000 tons, then declined to 10,000 tons in September and 14,000 tons in October. A continuation of the trade war would pressure the US to find other destinations to replace China. 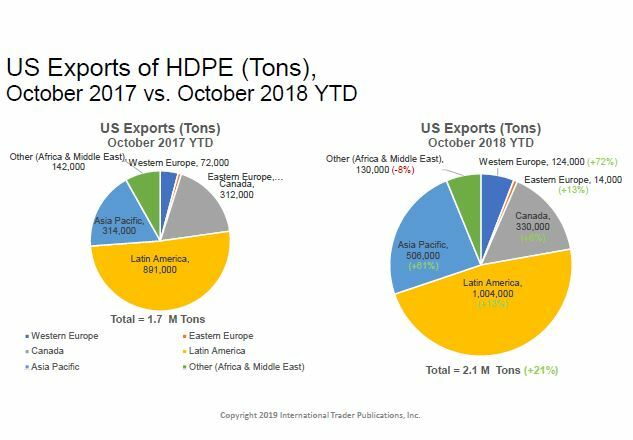 Developed from International Trader Publications’ US Polymer Trade Report.